Ideal for Bakeries , Supermarkets, Pastry shops, Pizzerias and All bakery product producers MONOFI Spiral mixers are ideal product for preparation ali sorts of dough that saves mixing time compared to classic mixing methods thereby increases performance and provides homogenous mixing. Mixing spiral mixes and aerates dough homogenously and since made of stainless steel hygenically. Different mixers are available according to capacity demands. 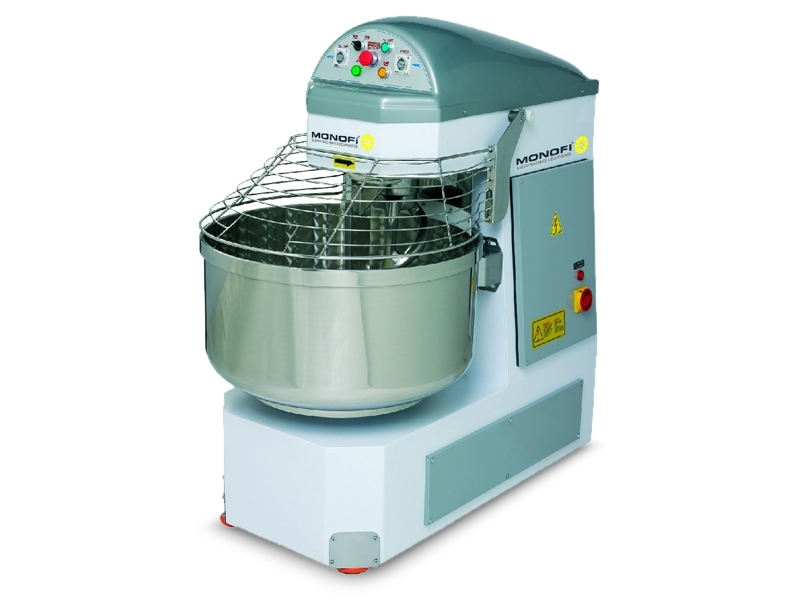 Mixer bowl is ideal for small quantity dough mixing in addition to full capacity dough mixing. This feature offers a great advantage for bakers who have wide range of products. All dough contact surfaces are made of stainless steel. Robust construction assures long life. Emergency stop function and security system is available on the bowl lid for emergency cases. Drive belt offers very silent operation. The device is mobile, with locking bearings are on the machine. The machine can be moved to a desired place and easily fıxed.